(The abstract:) Potentially dangerous cryptography errors are well documented in many applications. Conventional wisdom suggests that many of these errors are caused by cryptographic Application Programming Interfaces (APIs) that are too complicated, have insecure defaults, or are poorly documented. To address this problem, researchers have created several cryptographic libraries that they claim are more usable; however, none of these libraries have been empirically evaluated for their ability to promote more secure development. This paper is the first to examine both how and why the design and resulting usability of different cryptographic libraries affects the security of code written with them, with the goal of understanding how to build effective future libraries. We conducted a controlled experiment in which 256 Python developers recruited from GitHub attempt common tasks involving symmetric and asymmetric cryptography using one of five different APIs. availability of comprehensive documentation and easy-to use code examples seems to compensate for more complicated APIs in terms of functionally correct results and participant reactions; however, this did not extend to security results. We find it particularly concerning that for about 20% of functionally correct tasks, across libraries, participants believed their code was secure when it was not. Our results suggest that while new cryptographic libraries that want to promote effective security should offer a simple, convenient interface, this is not enough: they should also, and perhaps more importantly, ensure support for a broad range of common tasks and provide accessible documentation with secure, easy-to-use code examples. It’s interesting that even when developers took care to consider usability of their APIs, usability testing revealed serious issues. But it’s not surprising. The one constant of usability testing is that people surprise you. 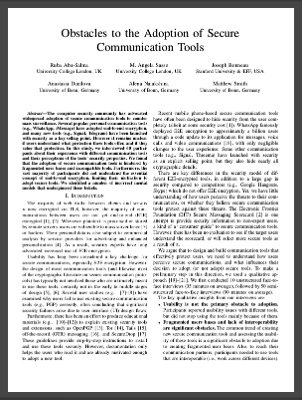 The paper is: “Comparing the Usability of Cryptographic APIs,” Yasemin Acar (CISPA, Saarland University), Michael Backes (CISPA, Saarland University & MPI-SWS), Sascha Fahl (CISPA, Saarland University), Simson Garfinkel (National Institute of Standards and Technology), Doowon Kim (University of Maryland), Michelle Mazurek (University of Maryland), Christian Stransky (CISPA, Saarland University), The Increasingly-misnamed Oakland Conference, 2017.